Anguilla, B.W.I. – June 23, 2015 – In keeping with the Anguilla Tourist Board (ATB)’s ongoing efforts to promote and strengthen the island’s product in its major market, tourism officials from the Ministry of Tourism and the Anguilla Tourist Board hosted a VIP media dinner on Monday June 15th at Zuma restaurant, the critically-acclaimed premier dining establishment in Downtown Miami which is home to Head Pastry Chef, Shawne Bryan, of Anguilla. Representatives from 15 of Miami’s leading outlets and publications including The Miami Herald, Huffington Post, Recommend, Caribbean Journal and Local 10 News – sat down to enjoy gourmet cuisine and a stunning signature Anguilla-themed dessert in the company of the Honorable Cardigan Connor, Parliamentary Secretary of Tourism; Permanent Secretary, Merwyn F. Rogers; Director of Tourism, Candis A. Niles; Cheryl Andrews Marketing Communications Principal, Cheryl Andrews; the Anguilla Hotel and Tourism Association’s Executive Director, Gilda Gumbs-Samuel; Anguilla Progressive Association of New York-Miami President, Godwin Carty; and CAMC Senior Account Supervisor, Jennifer Johnson. 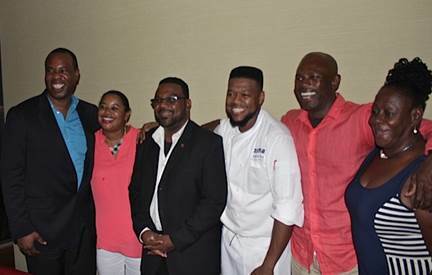 During their stay in Miami, members of the delegation also showed their support for the Anguilla national culinary team at CHTA’s Taste of the Caribbean, a showcase of Caribbean cuisine, which took place at the Hyatt Regency Miami from June 11 to June 14, 2015. 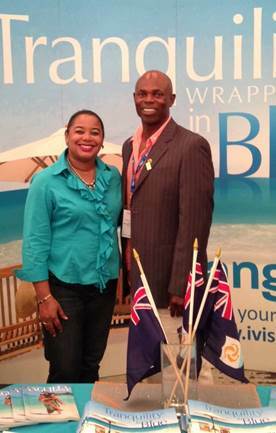 Anguilla’s team took a Silver medal for Caribbean National Team of the Year, with individual team members garnering gold for Pastry Chef of the Year and Most Creative Bartender; silver accolades for the Best Beef/Seafood categories and for Bartender of the Year, and Bronze for Chef of the Year and Junior Chef of the Year. CAMC representatives and Tourism officials were also on hand for the festival’s largest consumer event, Taste of the Islands, to provide the public with a wealth of information about Anguilla and the upcoming annual Anguilla Summer Festival, while the National Culinary team served up popular Anguillian-themed culinary treats and drinks. Anguilla is a British overseas territory located in the north eastern region of the Caribbean, just five miles north of St. Maarten, and 150 miles east of Puerto Rico. The island is best known for its 33 pristine, powder-white sand beaches, all with crystal-clear turquoise waters matched by few places in the world. With an inviting and welcoming approach to tourism, Anguilla’s beaches are what draw most visitors to the island, while its warm, friendly people keep visitors coming back. The island’s culture is infused with a love of the land and dependence on the sea, which is reflected in its history, and in many of the cultural festivals and events that celebrate Anguillian traditions of fishing, boat racing and cuisine. Anguilla is easily accessible via daily flights that connect directly to Anguilla from San Juan or St. Maarten. For those coming from St. Maarten, Anguilla is just a short seven-minute flight or 20 minute ferry boat ride away. For more information on Anguilla visit www.iVisitAnguilla.com.